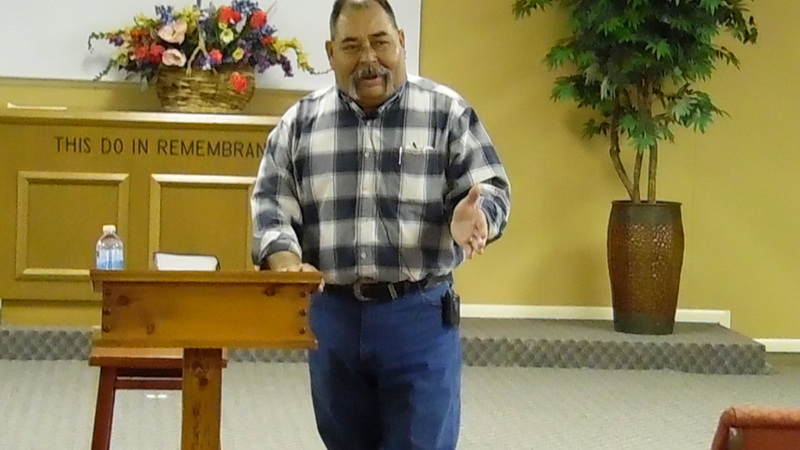 This my friend Richard, he got released from the hospital on friday evening, preached for our Church on Sunday. So why is this a big deal? Richard has only 5 Percent of his kidneys functional. He has had a stoke, heart bypass surgery and now his kidneys have failed. He went from being a man’s man (whatever that means) , that had been a rough, tough man all his life, to a man fighting for his life! Five years ago Richard and I met over a auto accident. Mine and my wife’s, we had rolled our pick up right in front of he and his family. When they stopped to see how bad we were hurt, he discovered I was his daughters pastor. That began our friendship, after five years that he has been attending our church, we have both had similar health disasters, except he has one upped me with the present kidney crisis. I’ve watched Richard grow spiritually so much that I asked him to lead a church service once. The result was so well liked that now he fills in for me more often so I can rest some. It’s part of what God has used to keep us fighting the health issues, when we would rather just quit some days. I am forever amazed how God placed our wives (both named Darlene ) and our church in our lives just when He knew we would need them most! Thank you Jesus, for my wife and family, my church, and my friend Richard. Thank you for liking my post. May God Bless your week! Great story. God is truly amazing.